There is a continuing controversy over the real height of Mt. Everest. The official Nepalese elevation is 8,848m (29,029 ft). 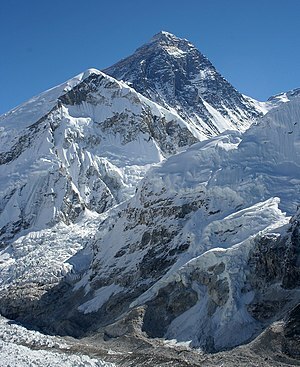 Nepal calculated the elevation of Everest by snow height. China calculates the elevation based on the rock height, which is four meters lower, 8,844.43m (29,017 ft). The elevation of 8,848 meters was recorded by an Indian survey in 1955. In 1999 a U.S. group using GPS technology recorded an elevation of 8,850 meters, which is the number used by the US National Geographic Society. Nepal hopes to resolve the conflict by doing a new survey. They will set up three stations and use GPS technology to measure the peak. The survey is expected to take two years to complete. Further complicating the issue, geologists say the mountain is gradually getting higher due to the shift of continental plates and is gaining 4 mm per year.